Hessler Street Fair, This Weekend In University Circle! 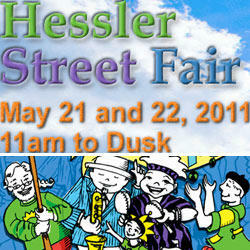 NOT TO BE MISSED, HESSLER STREET FAIR IS ONE OF CLEVELAND’S MOST SPECIAL EVENTS EVERY YEAR! This is one of those things that doesn’t get over-hyped, you kinda stumble on it your first time but after that you make sure you never miss it. With the welcoming of Spring comes the Hessler Street Fair just past Euclid in University Circle. Fun for the whole family or just you and your friends, come ready to enjoy music, art, food, dancing, cool people and a packed street of fun-filled activities all day long. This event signifies the coming together of area residents and visitors in a fun and friendly way that just makes you feel good. The profits go to preserve the Hessler neighborhood which was dedicated as a Cleveland Landmark in 1975. Area artists show off their talents as musicians jam and people sing and dance. Really just a lot of fun. Don’t miss out, this Saturday and Sunday from 11-Dusk. Next Post Parade the Circle-FREE-Sat June 11th!